Open most Wednesdays, 12-6 pm. We also are open for the Nedrow Community Yard Sales, Nedrowfest, occasionally on Saturday, sometimes after church on Sunday and always in an emergency. 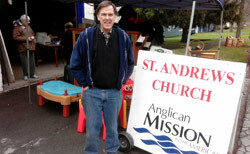 Carrying out Jesus' command to love our neighbors, St. Andrew's holds a weekly garage sale to provide clothes and home items for those in need, and eventually to provide meaningful work for people for persons who need it. We hope to bless the Nedrow community and be a welcoming place to all who stop in. OUR GARAGE SALE IS NOT A FUNDRAISER. Many churches have rummage sales to raise funds for missions or other needs in their church. We do this to help people. Over the past years we have helped women escaping difficult life situations and starting over, families who have lost their homes in fires, people who have been robbed, homeless persons, those in poverty, a city day care provider, an animal rescue shelter, many low income persons and average persons who just needed friends and a good deal. We have also been able to do house cleanouts for elderly persons, who have had to move from their home to senior care facilities because of illness. Currently we do this one day a week. We believe this will develop into a full-time business that will be able to employ some of those same persons as well as some persons who don't fit in the traditional work force because special needs. Jesus encouraged his followers to love their neighbors as themselves. This is one way we do that. Please join us. Thank you. Help St. Andrew's Garage Sale! DONATE! Contact us if you are cleaning out your home, office, storage unit or other location; have leftovers from your own garage or yard sale; or have other items to donate. We are accepting donations of housewares, sporting goods, electronics, yard tools & items, office equipment, art supplies, appliances, DVD's & CD's, outdoors goods, children's games and toys, clothes in new or excellent condition and other stuff. We also accept donations from businesses with out dated or overstocked inventory. We will give tax deductible receipts for donations. Drop off your stuff on Wednesdays or make an appointment for your donation to be picked up. URGENT NEED: We are seeking the donation of a box or cube van, pick-up truck, cargo van, some sort of large vehicle that would be useful when picking up large donations and doing house clean-outs. SHOW UP & VOLUNTEER! Every Wednesday we need help setting up, sorting new donations, assisting customers, drinking coffee and eating lunch, cleaning up and picking up donations from various places. SPREAD THE WORD! Like us on Facebook. Tell your friends about us. Know someone in need? Send them to us. Maybe we can help. Email Pastor Steve or call the church (315) 469-1655. Most Wednesdays we have an ad on Craigslist in the Garage & Moving Sales section. Located at 6136 S. Salina St. at the intersection of Lindbergh Rd. on the side of the building facing Mr. Tire across from Aldi's, Colonial Laundromat and Original Italian Pizza in Nedrow. We have stuff in the big blue garage and in the corner storefront. Look for the St. Andrew's Anglican Church sign. We are open rain or shine!